Can Seamers. 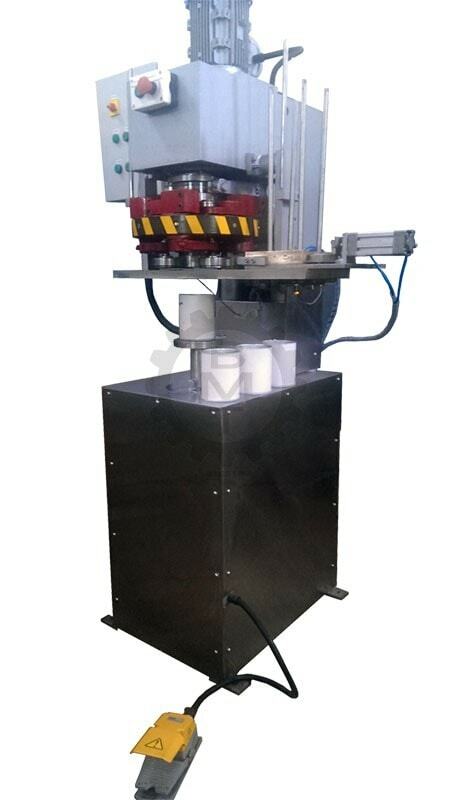 Semi-Automatic Round Can Seaming Machines for Metal, Composite, Paper and PET Cans. 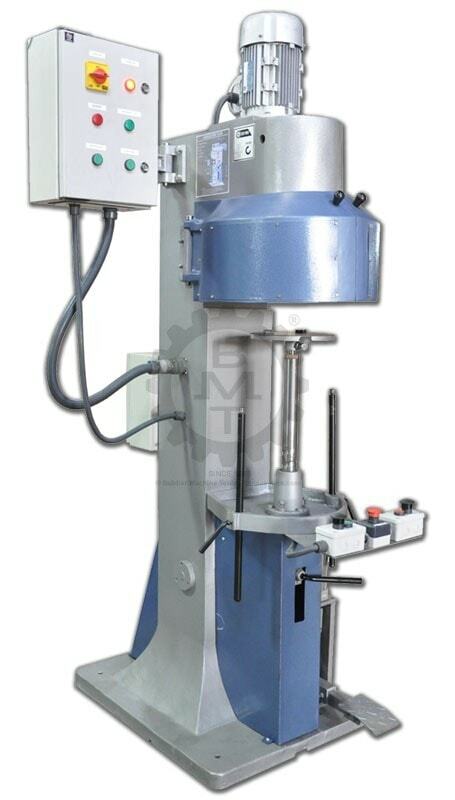 Semi-Automatic Round Can Seaming machine. 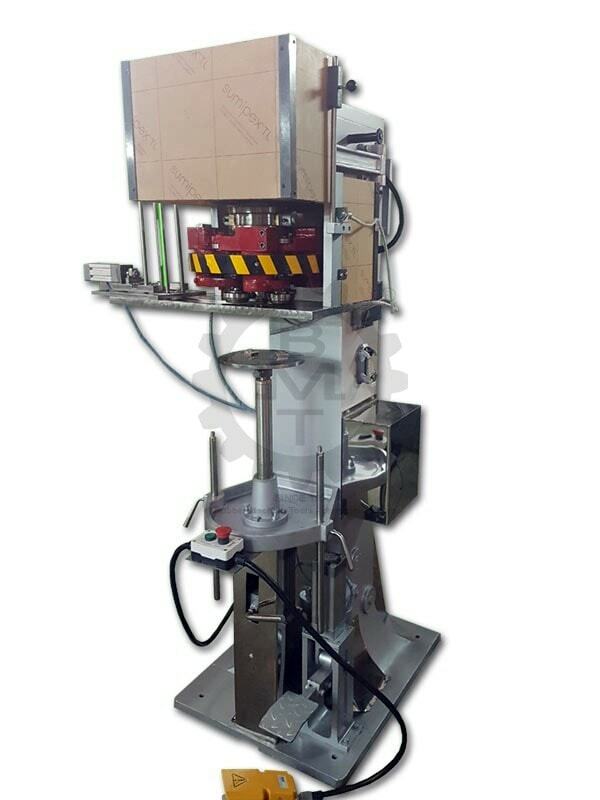 Dual Push Button or Foot Switch operation with Pneumatic Lifting system. 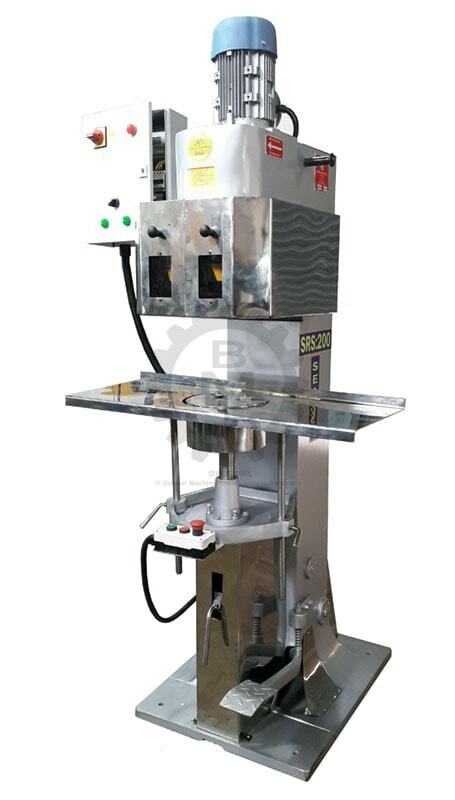 Can be fitted with an optional Automatic End/Lid Feeder. Available with Stainless Steel Tooling, Covers, Contact Parts and Cladding. Heavy Duty Construction with all moving parts CNC Machined. 4 Roller Seaming ensures consistent and leak proof Seaming. Ability to seam a wide range of Can Diameters with a quick changeover of tooling. For Height changes only a simple setting is required (no change parts). PLC or Timer based Control Panel (depending on order configuration). With Foot Switch: The Can with the Lid (End) to be seamed is placed on the lifter plate. A Foot Switch (electronic) is pressed and the seaming operation begins. After completion, the lifter plate with the seamed Can are automatically brought down to the rest position. With Dual Push Buttons: The Can with the Lid (End) to be seamed is placed on the lifter plate. The dual push buttons are simultaneously pressed and released. The Can is lifted to the Seaming Chuck and the seaming operation begins. After completion, the lifter plate with the seamed Can are automatically brought down to the rest position. SRS:200PN with Auto Lid Feed option. 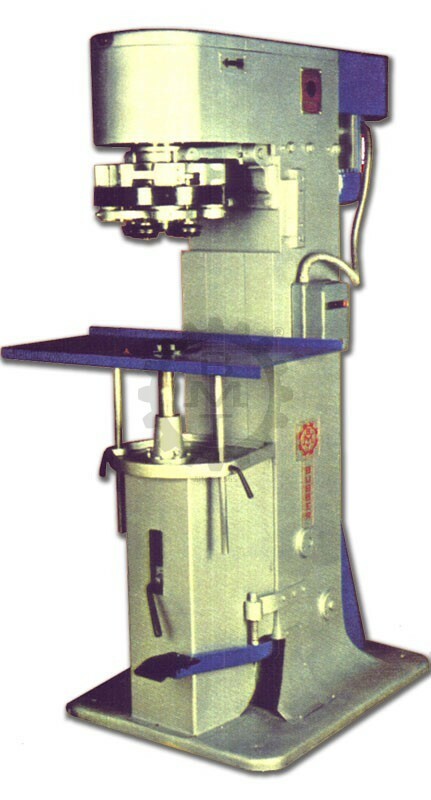 Machine shown without standard Safety Covers and Guards for clarity. 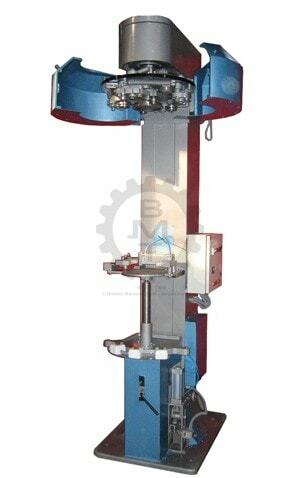 * Machine can be modified to suit customer requirements. The Can with the Lid (End) to be seamed is placed on the lifter plate and the pedal is fully pressed and released. The Can is lifted to the Seaming Chuck and the seaming operation begins. After completion, the lifter plate with the seamed Can are automatically brought down to the rest position, ready for the next Can. Will seam metal tops on to Metal, Composite (paper) or Plastic Cans. Semi-Automatic. Operated through Foot Switch or Push Buttons. 4 Roller Seaming ensures accurate and consistent Seams. Cans remain stationary during seaming. Compact Footprint makes it ideal for Lab Use. Heavy Duty Body made from Close Grain Cast Iron. Ability to accept a large range of Can Diameters & Heights with a quick changeover time. Exposed metal parts are powder coated for durability and finish. CE model and Full Stainless Steel model available. Easy to operate, maintain and service. The Can to be Seamed is placed on the lifter plate and the Foot Switch/Push Button is pressed. The Can is lifted to the Seaming Chuck and the seaming operation begins. After completion, the lifter plate with the seamed Can are automatically brought down to the rest position. Net Weight 450 Kgs. approx. Gross Weight 600 Kgs. approx. 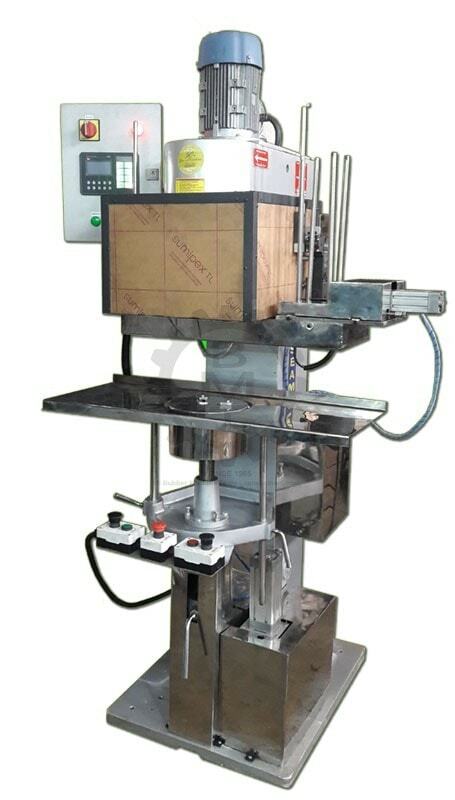 *Machine can be modified to suit customer requirements. Seaming Chucks and Seam Rollers are CNC machined for precision. Semi-Automatic. Foot-pedal or Foot Switch (Pneumatic Lift) operation. Drum remains stationary during seaming. 4 roller Drum seaming ensures consistent and leak-proof seaming. Ability to accept a wide range of Drum Diameters and Heights with a quick changeover. Easy to Operate, Service and Maintain. The Drum with the Lid (End) to be Seamed is placed on the lifter plate and the pedal is pressed. The Drum is lifted to the Seaming Chuck and the seaming operation begins. After completion, the lifter plate with the seamed Drum are automatically brought down to the rest position. The machine can be fitted with a Control Panel with Push Buttons and a Pneumatic Lifting system doing away with the mechanical foot pedal.